One of the popular, preferred, and preeminent tax saving investments is PPF – Public Provident Fund. We all know about PPF. Do we know all about PPF? Let us discuss in detail about PPF in this article and understand it comprehensively and completely. 1) Where to open the PPF account? PPF accounts can be opened in a post office and also ppf account can be opened in selected bank branches. The regular KYC documents need to be submitted for opening a PPF account with a minimum investment of Rs.500. 2) What is the interest rate? The current interest rate for PPF is 8.10% p.a for the april–june quarter of 2017. The interest rate will change every financial year in accordance with the Government bond yield. 3) How is the interest calculated? For the balance amount in your PPF account, the interest is compounded annually. However, the interest calculation will be done each and every month. interest only from the subsequent month. Therefore, if you make sure your contribution is getting credited in your account on or before 5th of that month, and then you will not miss the interest for that month as well. 4) What is the tax benefit? Under Section 80 C, whatever the contribution you make in PPF is eligible for tax deduction . Also, the interest from PPF is also tax free. 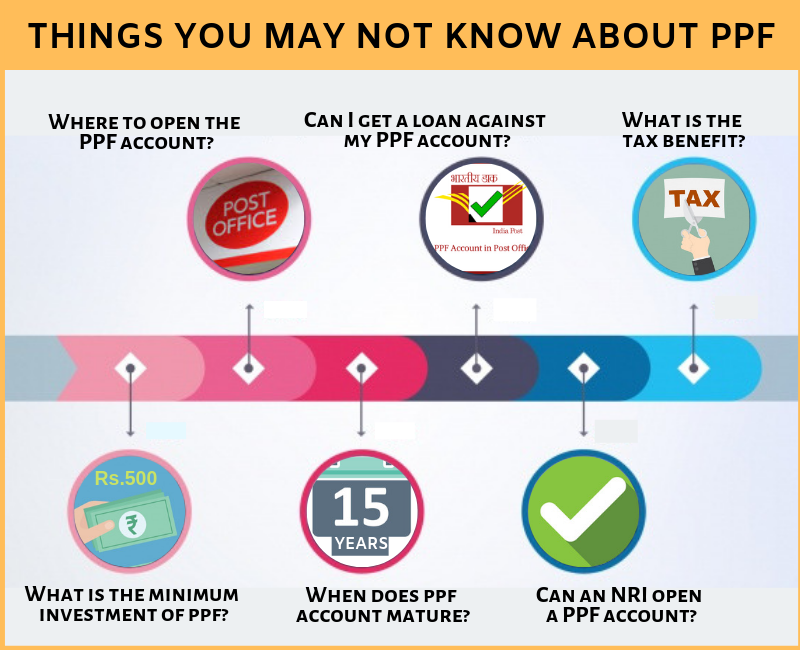 5) What is the minimum and maximum investment of ppf? The minimum amount needed to be invested every year is Rs.500. The maximum amount of investment allowed every year is Rs.1.50 lack. You can make investments through a maximum of 12 installments per year. If your minor child also holds a PPF account then the combined limit of both the PPF account is limited to Rs. 1.50 lack. 6) When does ppf account mature? 7) Can I withdraw from my ppf account in between? 10) What happens if the PPF account holder dies? In the event of the death of the PPF account holder, the balance amount in the PPF account will be paid even before the completion of 15 years, to the nominee or legal heir of the deceased person. The nominee or the legal heir is not allowed to continue the PPF account by making fresh contributions to it. With the above points, you could have got a clear review about PPF. PPF is an excellent tax saving option . It needs to be part of your tax saving investment or not, depends upon your overall tax plan and asset allocation for the current year. Do your tax plan and check PPF fits into your tax plan in the current year. What do you think about investing in PPF? If you have any queries about this let us know through the comment section. 1. In case of death in 16th year of the account, can the account be continued till coming March 31st which is anyway after the date of maturity without extension? There is no way to extend or officially continue PPF account after the death of the PPF account holder. However, PPF continues to give interest till the death claim is filed. Can a nominee of PPF be a Non Resident Indian . He is non resident as working out of India for more than 182 days in a financial year. Nominee of a PPF account can be an NRI. There is no restriction on that. 1. Can the account be continued till maturity without further contributions? 2. In case of death in 15th year of the account, can the account be continued till coming March 31st which is anyway the date of maturity? After death of the PPF account holder, additional deposit can’t be done. However, it can be continued with existing deposits that will fetch you interest. But it is riskier to continue the PPF account after the death of the account holder because a nominee can’t appoint a nominee. In case if the nominee also dies when the account is continued, the claim becomes complicated. Many thanks sir, my utmost appreciation for the effort of your team.